Than Kyaw Htay is inspired by the Pa-O people of the Shan States in the north-east of Burma. They are easily identifiable by the colorful turbans worn by both men and women. These paintings feature one or several figures standing or squatting, sometimes looking slightly off-balance, which the artist says is an echo of the dramatic changes that are going through the country now. They look out over a beautiful but empty countryside, which creates a feeling of isolation, another metaphor for the country as a whole. 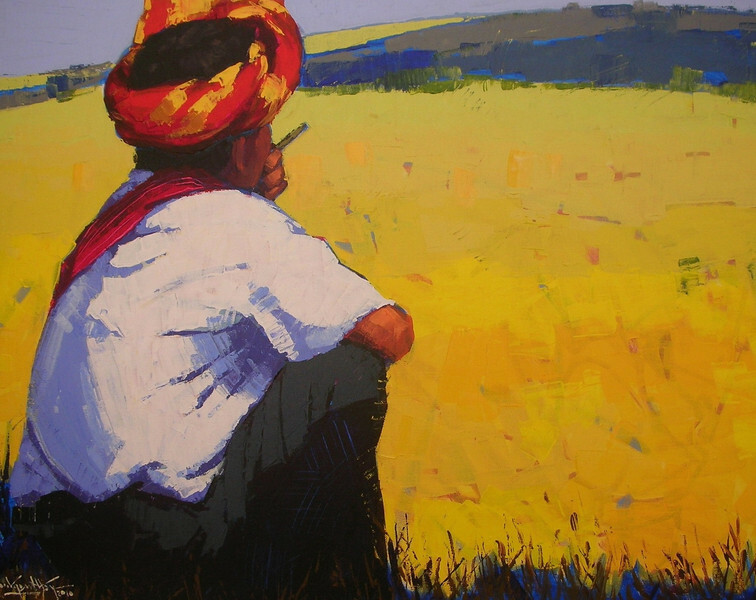 The artist says he paints the landscape in vibrant, vivid colors, because his people are longing for a brighter future as they stare into the distance. He depicts the backs of people, because, he says, Burma has turned its back on the world, but the figures are often outlined with a thin, uneven rim of warm contrasting color, which the artist says represents the hope for a better future. Inspired by Van Gogh, Than Kyaw Htay gives his paintings texture and added depth by scratching a comb through the pigments, at times revealing the contrasting under-painting. This technique smoothes and integrates the tones of the figures, clothes and landscape, giving the works an added dimension and energy.